Making the move from road races to having fun on the trails.. I sort of grew a beard for this one and I don’t really know why. My wife hated it and I certainly found it an annoyance. However once race day was looming I was damned if I would shave it off. I think it must be a mid life facial hair crisis. From a distance it looked like I had been eating coal.... badly. Needless to say I have toned it down since although it only got a trim rather than a full shave. I have now formed an attachment to it like an ugly puppy. I think when you have run a few ultramarathons before you start to “normalise” distances which any other human being would think totally stupid to try to run. This was to be my 7th ultra and was my longest to date. I wasn’t particularly worried. No siree bob, not me. 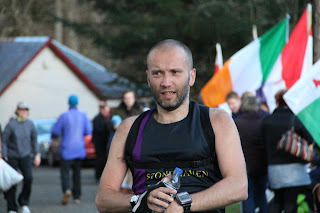 However, rather than think of it as “a jolly day out in the hills” I should have seen it as it really was - a tough double marathon (53 miles) over some crazy terrain in the highlands. That sounds hard and was a little more accurate with hindsight. At least this time I didn't get drunk the night before. 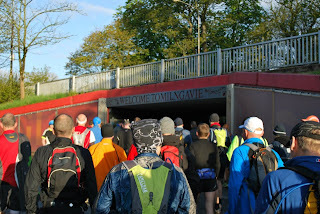 The start at Milngavie was a low key relaxed affair and we were off before I had the chance to reflect or worry. I had worn my heart rate monitor so I could keep the effort down in the first half of the race and keep the effort up whilst walking the hilly sections. However it gave an inaccurate HR/Pace reading (adrenaline?) until it was too late anyway. 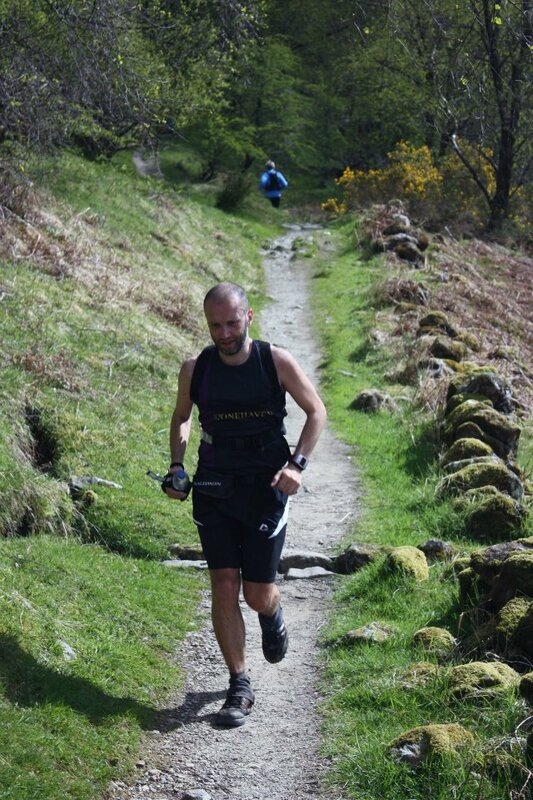 I felt fast but comfortable for the first half however this section was fairly easy underfoot. After this the terrain was much more difficult and I should have kept more back in reserve. I had been warned this THE DAY BEFORE by Karen! Stupid mistake and muppetry of the highest order. The second half (or second marathon in reality!) was either very tough underfoot or involved lots of hilly sections. Silly boy for running too strong in the first half. My frequency of walking increased the further I got however I was aware that I was more and more ahead of schedule at each checkpoint. I left the final checkpoint Bein Glas (40.5miles) in absolute pieces. I still had 12.5 hilly miles ahead of me and I just wanted it over. Not a nice feeling at all. It was at this point I spoke briefly to John Kynaston who said I’d be able to get under 11 hours if I cracked on a bit. This proved to be a real shot in the arm. 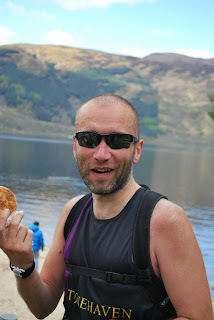 John is an experienced ultramarathoner so I reckoned he knew his apples. I made an effort for the next 6 miles of the final 12. Then I *really* gave up the ghost and just tried to get one foot in front of the other. I was even walking down some hills. Oh yeah, look at Mister Experienced Ultramarathoner - he runs everything* (*except uphill, downhill or flat sections). Who ate all the coal? It was going to end eventually and right enough I heard the pipers in the woods by Tyndrum. It was a brilliantly supported finish and very emotional. I don't think I’ve ever been as happy to cross the line in my life and the beer that George Reid gave me was the finest I’ve ever drunk. I came in at 11:08. I had planned for 11:45 so in all not bad for a race which I felt could have went better. It is an odd feeling though - I’d much rather have ran a 12hr or 12:30hr Fling and enjoyed it all (ie been more consistent) rather than get an OK time but only enjoyed 2/3rds of it. In terms of food I learned a few lessons. Sweet stuff every 15 minutes until about 7 hours and then switch to savoury every 15 mins or whatever you can stomach. Muller rice early on but switch to orange juice/lucozade later. Fizzy coke at each checkpoint is brilliant! The bits of the race I enjoyed the most were the bits most folk warn you about. Coming down Conic Hill was slippy but it was an absolute blast. The technical section at Lochside was also brilliant fun although I almost fell on my face 2 or 3 times which could have been nasty. 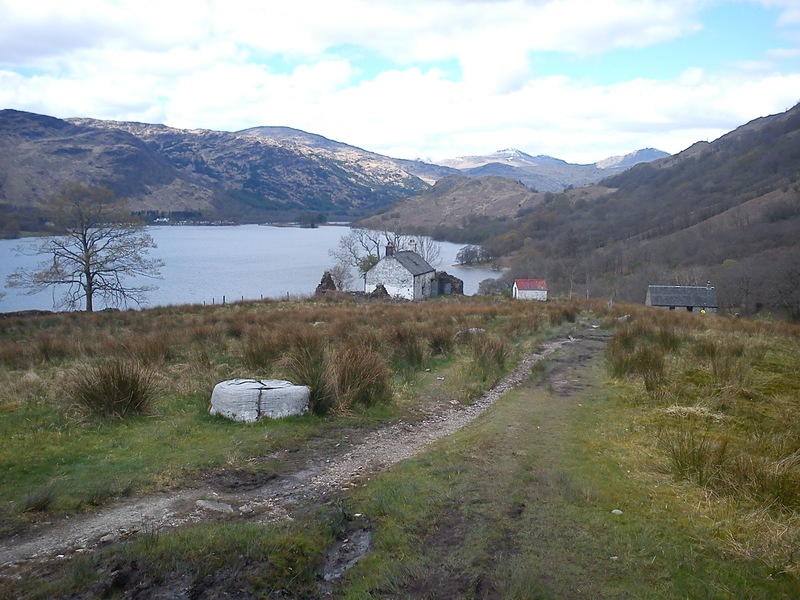 Some of the course was stunningly beautiful but I prefered the barren mountainous scenery of the northern part of the West Highland Way. It feels like running through Mordor. Overall then I had a mixed result. I learned a lot about pacing during bigger ultras (ie slow the hell down) and that my food strategy needs a little tweaking. I would also do it all again which is a good sign. “Luckily” I have another bigger run in a few weeks time to try to put these lessons into effect! Also, this was the first time I have felt achievement at finishing an ultra. Normally I’m just glad it is over but don’t have any “well done me” pat myself on the back feelings. I think it was the double marathon distance on tough terrain that did it. The only photo I took all day! It was great to see so many friendly familiar faces on Saturday. 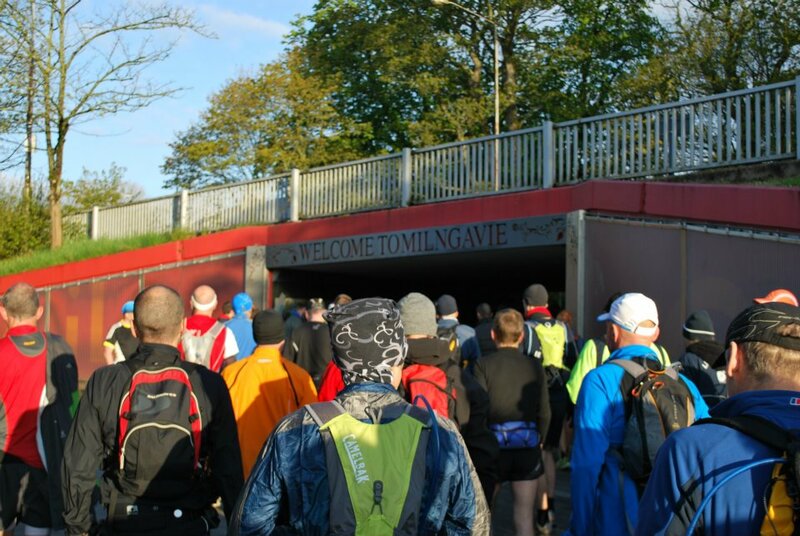 I felt lucky and privileged to be part of such a friendly well organised run. It is great to see mates who you only meet at these mental days out. EVERY runner that passed me said “well done” and I said it to every runner that I passed. How many running events does that happen in, eh? Great perspective Dave and good learning experience for the Cateran. Have a blast and well done! Great run Dave. It was good to meet you on the way up the loch. Hope you have a great run at the Cateran. Well done Dave. You were looking good when you went past us. Hope I didn't set your bar too high! I must admit I was having fun trying to work out what time various folk who went past us would finish in! Recover well and I look forward to seeing what you do next! Are you really the same Davy Morrow who I went to school with?! He couldn't run the length of himself! Aye Al, its a long way from trying to do as little as possible on the Rugby pitches at Friends! Hope you are well sir?